Sri Lanka has been able to produce irrefutable evidence to prove a direct link between the LTTE and three Australian Tamils under investigation for providing critical support to carry out high profile attacks including the sinking of a Fast Attack Craft (FAC P 418) off Vettilaikerni in May last year. The FAC, a part of the force deployed to protect a ship carrying 700 off duty personnel to their bases in the Jaffna peninsula went down after an explosive-laden stealth craft powered by four 250 horsepower outboard motors (OBMs) rammed it. This evidence has been brought to the notice of Australian Federal Police conducting the investigation, authoritative sources said. The Director of Public Prosecutions of the State of Victoria has charged Aruran Vinayagamoorthy, Sivarajah Yathavan and Arumugam Rajeewan, currently on bail, with being members of a terrorist organisation (LTTE) and for funding, raising and providing material support to a terrorist organisation. The sources said that the an SLN diving team which salvaged bodies of seven members of the FAC crew along with the ill-fated craft's main armaments, also recovered the tail part of the suicide craft. The Sunday Island learns that the four OBMs of Japanese origin had been inter-linked to the steering wheel by an Australian manufactured hydrive unit. The Australian Federal Police have been able to establish the origin of this unit with the help of its Australian manufacturer. What the suspects didn’t expect was that the Australian company maintains a complete list of its customers, the sources said noting that the Australian Federal Police have been meticulous in their investigations. Police have also recovered photographic evidence of the suspects together with a person identified as Jayakumar, believed to be the ring leader, who subsequently died of a heart attack onboard an LTTE vessel off Mullaitivu. The navy is also believed to have recovered two more Australian manufactured hydrive units during two engagements this year. One of the units had been recovered from the LTTE’s ‘wave rider’ class large attack craft (Indumathi) which was salvaged off Thalaiadi on June 19 this year. The other had been found last February when the SLN seized a fibre glass dinghy off Baththalangunduwa. Speculation is that Jayakumar had been involved in the acquisition of aircraft by the LTTE and that the deal may have been finalized in Australia. Senior Sri Lankan security forces, legal and law enforcement officials have testified at the Australian proceedings via satellite link from Colombo - something unprecedented here. 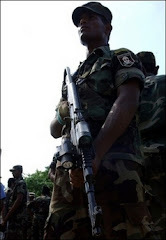 Among those who gave evidence were Army Commander Sarath Fonseka, Navy Commander Wasantha Karannagoda, Police Chief Victor Perera, Deputy Solicitor General Yasantha Kodagoda, Admiral Thisara Samarasinghe and several other senior military, police and STF personnel. The suspects have been accused of running an LTTE fund-raising network in Australia using a front organization called the Tamil Co-ordinating Committee, which annually channelled to the LTTE several million Australian dollars, collected in the guise of humanitarian and tsunami aid. Investigations into the activities of the three suspects by the Joint Counter Terrorism Team of the Australian Federal Police began two years ago as part of an anti-terrorism initiative during which Australian investigators met with and obtained the assistance of their counterparts in Sri Lanka to carry out local investigations. The army and navy had also obtained irrefutable evidence that PCBs (Printed Circuit Boards) used by the LTTE to trigger a series of claymore mine explosions were of Australian origin. The Sunday Island learns that the Australian investigators have been able to establish the identity of the manufacturer and also the fact that the suspects had carried the consignment through the Australian Customs. Sri Lankan officials expressed confidence that the ongoing case would prove beyond doubt the way the Tamil Diaspora had manipulated laws and regulations to provide both financial and material support to the LTTE.